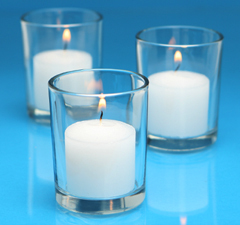 Case of 72 clear votive holders made of thick, sturdy glass. Holders measure approximately 2 1/2" tall and 1 3/4" in diameter. Case of 72 unscented white votive candles. (Designed to burn for 10 hours.) 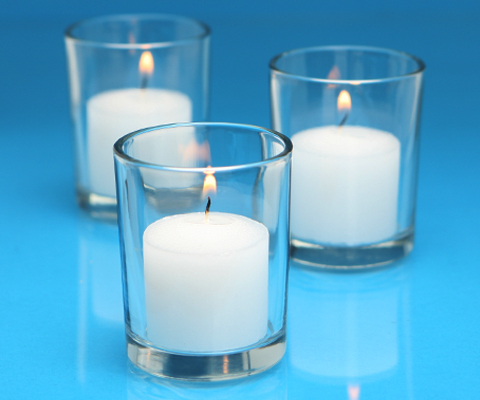 Candles measure approximately 1 1/2" tall and 1 3/8" in diameter. Candles are smokeless. Made of 100% paraffin wax with lead-free cotton wicks. A quality item, Made in the U.S.A. In warm weather months, candles may not ship till the Monday after you place your order. Click here for details.